Queen Mary's Peak at the top of Tristan da Cunha's main volcano rises to 2062 metres (6760feet) above sea level. 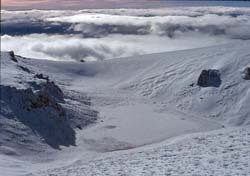 The summit crater contains a heart shaped lake. The Peak rises to 2062 metres (6760feet) above sea level. It is a classic volcanic cone with a central crater. 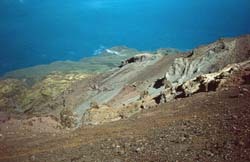 Upper slopes are mainly bare of vegetation and are chiefly composed of loose volcanic ash or cinders, produced during eruptions from the central crater. Heavy rain has already reduced the height of the Peak (probably by some 200 metres in height) by gully erosion as seen in the high radial V-shaped valleys with intervening narrow ridges leading to the broader Base below. The summit crater contains a heart-shaped crater lake, frozen in winter but tempting for a very cold swim for summer climbers! Frequently the Peak is clear of a band of lower cloud as in this view taken on Ascension Day 1984. View from The Peak show the three main mountain vegetation zones : in the foreground cinder scree with patches of lichen( in the wild upper portion of Deep Gulch valley); in the middle distance an area of grasses provides the best sheep grazing (but not in this southern and most isolated part of the island), and beyond is the greener Base, dominated by the tree-fern Blechnum palmiforme. Two craters on the base can be seen, Stony Beach Hills (with a single lake) and Cave Gulch Hill (with two crater lakes). These parasitic cones mark local volcanic eruptions. It is this southern area of the Peak and Base which is least explored and visited - it is also forms the main Tristan breeding ground for the Atlantic Yellow-Nosed Albatross and other sea birds. 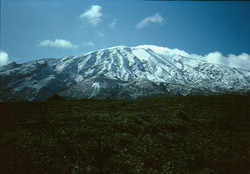 Queen Mary's Peak is easily the highest island mountain in the South Atlantic Ocean. It has been viewed by many thousands of sailors seeking the fastest route from Europe to the Indian Ocean and beyond. In the 17th Century the East India Company instructed captains to sail via Tristan and the island was on a 'maritime motorway' until steam replaced sail and the Suez Canal provided an easy alternative route in the 19th Century. 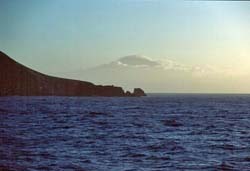 It is not a coincidence that Ellen Mc Arthur sighted Tristan Peak on her record-breaking circumnavigation in 2004.In this view from Nightingale Island, Tristan is enveloped in cloud, but the high southern peak cinders are in sun.